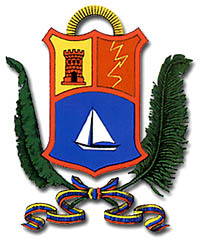 The translation: "The flag of the state of Zulia was created by Jose' Antonio Urdaneta. It was officially adopted at January 23rd, 1991. The colour blue represents the hidrography, the lake, the gulf, rivers; the colour black represents the oil; the sun, represents Zulian heat (warmth ? ), hospitality and wealth. The lightning represents the Catatumbo ray, guide of the Zulian citizen."